The U.S. Bureau of Engraving and Printing (BEP) announced it will distribute free currency readers to eligible blind and low-vision individuals, a preemptive solution to the Federal Reserve’s tactile-enhancement of currency notes. Originally announced in the form of a July 2014 press release, the BEP and National Library Service for the Blind and Physically Handicapped, Library of Congress (NLS) are collaborating through their U.S. Currency Reader Program to promote access to paper currency. This serves as a BEP initiative, which is also realized through the BEP’s assistance when developing the Wireless RERC-funded IDEAL Currency Reader®. Currency Readers are currently available and may be requested by submitting the U.S. Currency Reader application form to: U.S. Currency Reader Program, 14th & C Streets, S.W., Washington, DC 20228. The form is available in English and Spanish, and may be accessed HERE. Additional information is also available by contacting BEP at meaningful.access@bep.gov or (844) 815-9388. Microsoft is seeking people who have experience using either screen reading or magnifying products. They seeking people in the Seattle or King County area who can travel easily to the Redmond campus. • Call 425-242-8030 to sign up or get more information! Metro launched a Puget Sound Trip Planner app—available for Apple and Android mobile devices—in January. It allows riders to plan a trip that covers many transportation choices, including buses, rail, ferries, streetcars, and water taxis. It merges popular features available on existing trip planners and offers real-time predictions for bus arrivals. Since launching the app, the developer has worked to improve its accessibility with screen reader technology. We need your help to test these improvements! Testers will need to have a mobile device that fits the minimum requirements for the iPhone or Android app they plan on testing. Plus they need to have a high proficiency in the use of screen reader software for their device. To participate, please contact Damon Berbert at damon.berbert@kingcounty.gov. In your email, you’ll need to specify what phone you have, as well as the version of the operating system and the name of the screen reader software you currently use on your phone. After receiving this information, we’ll get back to you about whether you qualify to participate and the details to help test the app. We expect the testing process to last no longer than a week. Testers will be given a list of tasks to complete using the app, then provide feedback on the experience. Thanks in advance for your help to make sure our technologies work for all our users! 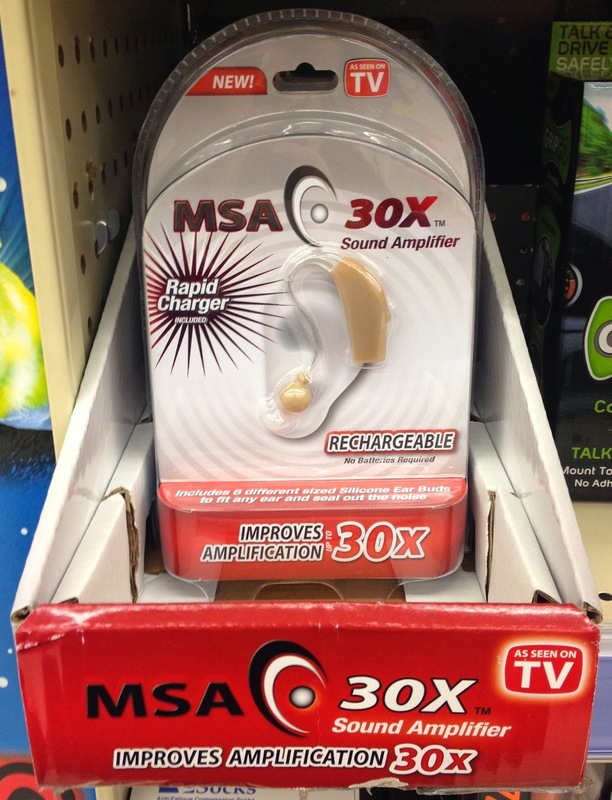 Are $20 "Hearing Aids" a Good Bargain? 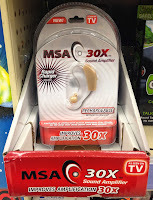 There is a new trend we will be seeing more and more of in the stores, newspapers, and advertisements: inexpensive personal sound amplification products being sold at your local drugstore. One of the reasons you'll see more ads and products focused on hearing amplification is because we are entering the retirement age of the huge Baby Boomer population (people born between 1946-1964), many of whom are not adequately prepared financially for retirement and who may be living longer but are less healthy. These health problems are red flags for acquired hearing loss and/or tinnitus. Also, just as vision tends to change with age so can hearing. This is often a gradual change over a period of years, and often the person who is hard of hearing does not realize it. We know that quality hearing aids have always been and continue to be expensive, ranging from a little less than $1000 to over $4000 each depending on the level of technology, services included in the cost, and location of the clinic. For example, we have a client who feels that the cost of traveling to Seattle from New York is a better value than being fit with hearing aids by an audiologist in Manhattan. She bases the value on the quality of hearing aid fitting, sound quality, our customer service, and overall satisfaction of care we provide here at HSDC versus her experiences in Manhattan. • Only hearing aids are intended to make up for impaired hearing. • Buy a personal sound amplifier only after ruling out hearing loss as a reason for getting [a PSAP]. • PSAPs are not intended to make up for impaired hearing. Instead, they are intended for non-hearing-impaired consumers to amplify sounds in the environment for a number of reasons, such as for recreational activities. Basically, PSAPs take sound and amplify it, just like turning up the volume on your radio. Period. This is the equivalent of using a magnifying glass to see rather than getting your left and right eyes tested separately with clinical equipment, getting a prescription for eyeglass lenses or contacts by an optometrist, and being fitted with them by a trained optician. Even basic hearing aids are extremely sophisticated computers. They analyze and modify sound with the goal of reducing background or unwanted sounds and improving a person’s ability to understand what people are saying. Now that you've got the facts, you’ll see why these sound amplifiers are not equivalent to hearing aids. If you know anyone who does have hearing aids and is not satisfied with the way they sound, encourage them to contact their audiologist for programming adjustments and make sure they are getting updated hearing tests at least every two years. This will ensure the hearing aids are programmed to their current hearing status. Everyone hears differently and lives in different sound environments. All hearing aids need to be programmed and re-programmed according to the individual. It’s getting close to that time of year! The Washington Assistive Technology Act Program and the Washington Access Fund will present a free webinar on Nov. 21st to learn about adaptive gizmos, gadgets, and practical ideas that make great gifts for people of all ages this holiday season. We will review both low-tech, cost effective devices, to more high-tech and expensive gadgets. The webinar will include a range of mainstream devices (items that may not be specifically designed as AT), and actual AT products. WATAP's AT Specialists will explore devices for people with a range of functional needs and abilities that will make great small gift ideas, to fabulously wrapped presents. Please join WATAP and the Access Fund on November 21st, from 10:00am-11:30am for a gift guide webinar on assistive technology. 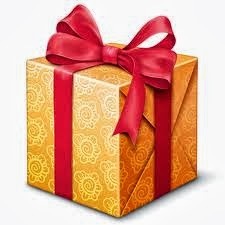 Do you have suggestions for AT gifts this holiday season? Visit our Facebook page (https://www.facebook.com/wa.assistivetech) to post suggestions you would like to see shared in the webinar. Visit this link to register for this free webinar: https://catalyst.uw.edu/webq/survey/gabyd/199981, or call 800 214-8731. Once you have registered, we will provide you with a link to attend the webinar, and call-in information. Are You a New WATAP Advisory Council Member? We're recruiting new members for our consumer majority Advisory Council! Would you like to be a part of visioning program activities and partnerships for assistive technology service deployment in Washington State? If you use assistive technology or are parent of assistive technology user learn more about the council and how to apply. Webinar - AT for Sports and Recreation rescheduled for September! Please join the Washington Assistive Technology Act Program (WATAP) and the Washington Access Fund for a free webinar on AT for Sports and Recreation on Thursday, September 26th from 11:00am to 12:30pm. Seattle Adaptive Sports provides sports and recreation for youth and adults with physical disabilities throughout Western Washington. Learn about opportunities available for team and individual sports for individuals with disabilities in your neighborhood, Washington and across the country including where or how to get equipment; earn a college sports scholarships and become an elite Paralympian. Visit this link to register for this free webinar: https://catalyst.uw.edu/webq/survey/gabyd/199981, or call 800 214-8731. Once you have registered, we will provide you with a link to attend the webinar and call-in information. This webinar will be captioned. The Washington Assistive Technology Act Program points the way to Assistive Technology solutions. WATAP is a federally funded program that works with partners around the state to offer free and low-cost, inclusive services to Washington residents of all ages with any disability. WATAP is part of the Center for Technology and Disabilities Studies at the University of Washington.